You'll be £12.99 closer to your next £10.00 credit when you purchase Post-War Childhood. What's this? Many British baby boomers are very nostalgic about a supposed golden age; a vanished world when children were generally freer, happier and healthier than they are now. They wandered about all day; only returning home at teatime when they were hungry. Nobody worried about health and safety or 'stranger danger' in those days and no serious harm ever befell children as a result. 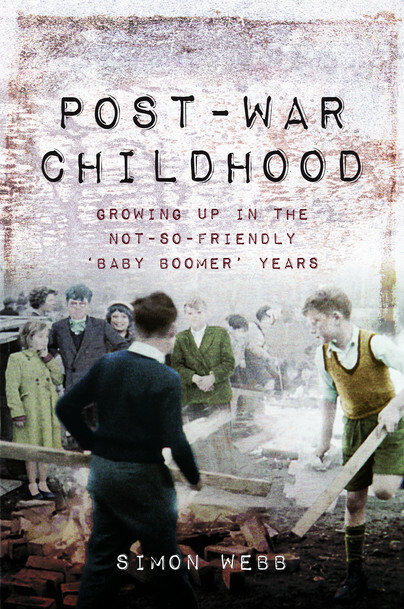 In Post-War Childhood, Simon Webb examines the facts and figures behind the myth of children's carefree lives in the post-war years, finding that such things as the freedom to roam the streets and fields came at a terrible price. In 1965, for example, despite there being far fewer cars in Britain, 45 times as many children were knocked down and killed on the roads as now die in this way each year. Simon Webb presents a 'warts and all' portrait of British childhood in the years following the end of the Second World War. He demonstrates that contrary to popular belief, it was by any measure a far more hazardous and less pleasant time to be a child, than is the case in the twenty-first century. An educational offering seriously slanted against the 'strange myth which has been sedulously propagated over the last few years by baby boomers about the idyllic nature of their childhood.' If you are researching this period of childhood, then I would certainly recommend it to be on your reading list, together with its excellent bibliography. Simon Webb presents a 'warts and all' portrait of British childhood in the years following the end of the Second World War. He demonstrates that contrary to popular belief, it was by any measure a far from hazardous and less pleasant time to be a child, than in the case of the twenty-first century. This is me: I'm a baby-boomer, born in 1946, and totally not responsible for everything that's wrong with the world today. Simon Webb describes a world I grew up in, graphically and accurately - it was a world where everyone knew their place, and proper respect was accorded to those in authority. Fascinating, and just as I remember it!